OUR NEW WEBSITE NOW ONLINE. 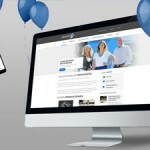 The relaunch of the website presents the family enterprise RINGHOFFER with a new look and feel. It is the "digital business card" which serves as the new corporate website of Ringhoffer. "For us it was important that the website was more user-friendly and put the whole content and information about our production into an attractive and modern design", explains Nina Ringhoffer, Head of Marketing and since March 2015 member of the management team.